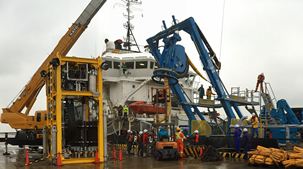 Subsea Geoservices Inc. (SGSI) is a subsea operations company with a focus on reliable physical geophysical and geotechnical investigation at water depths to 3000m. SGSI is committed to expanding our reach below the sea and making deepwater drilling and excavation programs accessible and safe. SGSI can also provide engineering solutions to meet customers’ specific requirements by designing and building innovative tools. Copyright © 2018 Subsea Geoservices Inc (SGSI). All Rights Reserved.